Description: This animal may reach 17mm in length. The body is white with characteristic yellow/orange patches. There is a curved, posteriorly-directed, orange tipped process at the base of each rhinophore and on either side of the branchial plume. The oral tentacles are long and streaked with orange pigment and there is a pair of recurved propodial tentacles that are similarly pigmented. The lamellate rhinophores are yellow/orange in colour. Habitat: All records of this species are from shallow water. Trapania species feed on kamptozoans which are tiny animals previously classified with the bryozoans, which live attached to the surface of sponges, bryozoa and hydroids. Distribution: This is a rare southern species in the British Isles, recorded from the Lleyn peninsula in Wales and Portland Bill, English Channel. Elsewhere it is known from the Brittany coast of France and the western Mediterranean. 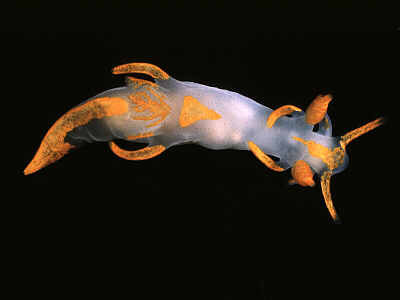 Similar Species: There are several other species with similar coloration including Polycera quadrilineata, Polycera faeroensis and Trapania tartanella. The pattern of the yellow pigment on the body. Recurved yellow processes at the base of the rhinophores and alongside the gills. Orange pigment line extending from tail to gills. Picton, B.E. & Morrow, C.C. (2016). Trapania maculata Haefelfinger, 1960. [In] Encyclopedia of Marine Life of Britain and Ireland.